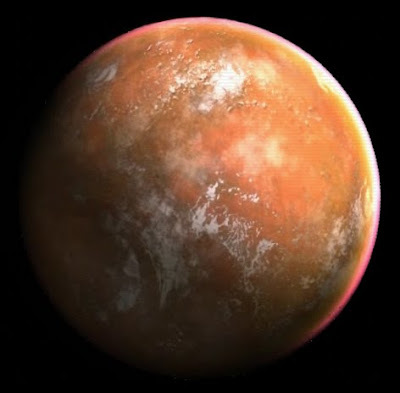 Korriban, originally known as Pesegam during the reign of Xim, was the sole planet in the Horuset system, located across the galaxy from Koros Major. It was the original homeworld of the Sith species and a sacred planet for the Sith Order, housing the tombs for many ancient and powerful Dark Lords of the Sith, and containing tremendous dark side power. After the Hundred Year Darkness, the remaining Dark Jedi interbred with the Sith species and ruled the Sith using their Force powers. After the Great Hyperspace War, Korriban was abandoned and became a barren world. It was the site of two Sith Academies, and became the headquarters of the One Sith. This remote, forbidding planet was the original homeworld of the Sith species. The Rakata invaded Korriban in an attempt to integrate the world into the Infinite Empire, intending to harvest slaves from the planet to be used for Rakatan projects, such as the Star Forge (30,000 BBY). The sole artifact to survive this era was the ancient Star Map, around which the tomb of Naga Sadow was later built. The Rakata were eventually forced off the world after the Sith King Adas led his people against them. Adas died in the battle, and thus, despite this victory, the Sith society crumbled, and, in the ensuing centuries of strife, the Sith relocated to Ziost, leaving Korriban as a graveyard world. The Sith Empire was founded in approximately 6,900 BBY by exiled fallen Jedi fleeing the Battle of Corbos, which concluded the Hundred-Year Darkness. The fallen Jedi landed on Korriban. Using their training in the Force, the fallen Jedi amazed the Sith and elevated themselves to god-like status on Korriban, becoming the rulers of the Sith people. As years passed, and interbreeding occurred between the Fallen Jedi and the Sith, the term “Sith” came to mean not only the original inhabitants of Korriban, but also their fallen Jedi masters. Until the rise of Naga Sadow, the existence of the Sith Empire was unknown to the Galactic Republic. Under the pall of Sith magic, this desolate world became more hellish and dangerous.The Sith Lords erected huge palaces and burial complexes to honor their fallen Dark Lords. Circa 5,000 BBY, the planet became an endpoint of the newly-formed Daragon Trail hyperspace lane, when it was discovered by Gav and Jori Daragon. This event triggered the Great Hyperspace War. After the fall of the Sith Empire, the planet lost much of its prominence in the galaxy, eventually falling off the galactic starcharts for a thousand years. Korriban was resettled prior to 3,993 BBY by Dark Jedi survivors of the Exar Kun War, and was home to the new settlement of Dreshdae and a Sith training academy. In 3,993 BBY, as part of the Great Hunt, Duron Qel-Droma and Shaela Nuur died on the planet, failing to cleanse it of terentateks. The planet became the sector headquarters of the Czerka Corporation. Darth Revan and Darth Malak visited the planet on their quest to discover the Star Forge. 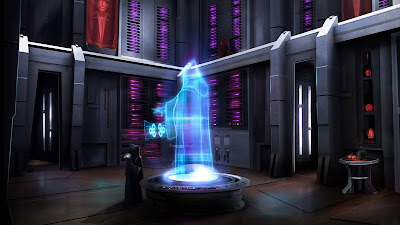 After losing his memory, Revan visited the academy again in 3,956 BBY on his quest to re-discover the Star Forge for the good of the Republic. Seeking the Star map in Naga Sadow’s tomb he passed the tests and then confronted Uthar. With the death of Master Uthar Wynn, the academy’s headmaster, and Darth Malak himself at the hands of Revan in 3,956 BBY, the Sith Order collapsed into a civil war (which took place 3,956-3,950 BBY) which decimated the Sith Order. It took the Republic a couple of years to send an expeditionary force to Korriban (around 3,954 BBY) in order to deal with any potential Sith who might attempt to take up the mantle of Dark Lord. They found a planet nearly in ruins—barren and lifeless as a result of the then unknown civil war. It was assumed by the commanders of the Republic task force that the remnants of the Sith turned on each other, vying for what little power remained. It was also said that Revan had always intended to return to Korriban one day to subdue any would-be Sith insurgents, but he then disappeared. However, the Republic discovered evidence that several Sith Lords did manage to escape the planetary conflagration, fleeing to remote corners of the galaxy. 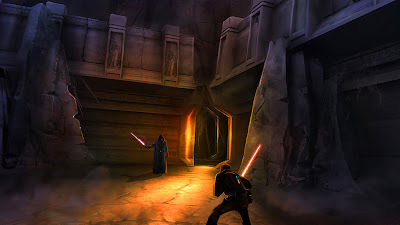 After the fall of Darth Malak, the ancient tombs within the Valley of the Dark Lords were plundered by grave-robbers. Each tomb was once infused with history and heritage of the old Sith Empire, containing great mysteries and powerful relics of the Force. Many broken, charred corpses littered the plains of Korriban during this time, virtually all that remained of the Sith who once inhabited the world. However, their malignant spirits remained, ready to confront any who disturb their rest by way of their guardian-familiars, the Hssiss. In the chaos following the Jedi Civil War, which nearly destroyed the Jedi Order, Jedi Master Lonna Vash used Korriban as a hideout. She was eventually trapped and killed by Sith Lord Darth Sion in the ruins of the academy, and then used as bait to lure the Jedi Exile into Sion’s hands. After escaping the trap, the Exile discovered the long lost tomb of Ludo Kressh. Retaking Korriban was a priority for the Sith Empire, when it re-emerged during the Great War. They retook the planet and re-established the Sith Academy. Due to the planet’s harsh terrain (or the power of the dark side), Korriban’s native fauna was both vicious and cunning, such as the fierce terentateks. The bat-like Shyracks lived in great numbers in caves on the planet. Tuk’ata, sometimes called Sith hounds were also fairly common, particularly in the Valley of the Dark Lords. Dark side dragons, or Hssiss, could be found on Korriban, though as semi-aquatic creatures, they were quite rare. Wraid were also found on Korriban. There is evidence that, at one point, the planet was home to an ape or primate-like species, although by the time of Naga Sadow the species was long extinct. Though it is possible that the primate-like species was somehow connected to the Sith species, no conclusive link between this species and the Sith species was known. The highly venomous pelko bug was an insect native to the planet—its venom had a potent numbing effect and was used in Sith training sabers by the Brotherhood of Darkness during the end of the New Sith War. Though Ziost was established as the original Sith homeworld in The Golden Age of the Sith, many sources described Korriban as the Sith homeworld. It was the “public” capital world of the Sith Empire during the era of Darth Revan, but was a mausoleum-world for millennia beforehand and would return to such a state not long after. The controversy was put to rest in the article Evil Never Dies: The Sith Dynasties by Abel G. Peña, which clearly established the Sith originating on Korriban and relocating the capitol to Ziost before the arrival of the Dark Jedi exiles during the Hundred Year Darkness, though the Dark Jedi exiles themselves landed on Korriban. Without Adas’ unifying influence, wars once again raged for rule of the Sith people, with the reigning combatants arrogantly claiming the title of Sith’ari, and eventually forcing a relocation of the Sith capitol to the planet Ziost. Eventually, almost two-dozen millennia after Adas’ death, a proper successor to Adas seemed to come at last. Known in Republic space as the Exiles, traitorous Jedi defeated in a galactic war called the Hundred-Year Darkness arrived on Korriban and cowed the Sith people with their astounding Force abilities, lightsabers, and superior technology. The word korban means sacrifice in the Hebrew and Malay languages. It is used in the Torah or Old Testament when referring to the fiery sacrifices the high priests made to God. This may be a connection to some of the violent sacrifices the Sith Lords made to gain and in attempts to gain power.